When my youngest sister gave birth to a lovely little girl in September I knew that I had to make her a very special baby cot quilt. It had to be designed just for her and I wanted the whole family to contribute to it, although I wasn't quite sure how I was going to do that. I knew that hubby and master 13 were not going to be excited by the idea. My two daughters, on the other hand, were eagerly waiting for me to start so that they could begin. They have both grown up with sewing and I knew that incorporating some hand embroidery work was a good idea and in safe hands.The challenge was to motivate my two men folk. Then I stumbled across this wonderful new book all about baby cot quilts and my hopes lifted. Something about this baby cot quilt book inspired me and made me smile. The fun and quirky designs appealed to me and I knew my younger, artistic sister would fall in live with them too. More importantly it presented me with a solution to my baby cot quilt design. I now knew how I was going to involve all my family (including my reluctant men folk) with the design of the quilt. Have a peek inside this book and you will see what I mean. Many of the designs include little hand draw sketches of delightful creatures. So my plan is to get my men folk, who are thankfully both good at drawing, to sketch some special little characters to appear in the baby cot quilt design. And I know my girls will have heaps of fun embroidering some designs like these. It would also be fun to include some applique, like these amusing little monkeys. Thanks to this inspirational book called "Quilts Baby" by Linda Kopp, I now have lots of fun ideas for my baby cot quilt. I just need to find a free weekend so that I can get started. Here's the link again if you would like to take a peek. What a lovely, lovely blog!!! I am a new quilter, have only been sewing for less than two years.....and I love seeing blogs like yours, full of ideas and beautiful things!! I just wanted to thank you for the Christmas redwork pattern. I used it on a Christmas table runner I made for a sweet couple that was married this past summer. They are living in London, England. 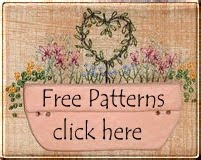 Love your free patterns!!!! I have thumbed through this book a few time. I hope to own it one day, I just love it.